We feel like we are in the middle of a very long finish line afer a very long run. Just wondering if the race will be finishing after the next corner, with other words, we are tired. Tired of winter, tired of waiting and me I am tired of head aches. Working, being a good parent and planning a move is not the easiest thing and stress on me means migrain and stress related head aches. Pain. Trying to rest. Pills. Trying to rest. Not stress. Do something fun. Trying to work. Calling the doctor. Again. Yes, a little picture on how it looks here right now. Well, things are moving forward though. We have had a moving firm here to get price ideas on what it can cost, and how it works to send some of our things down to the house. And he thought we had rinsed very well and that we were well planned. Always nice to here that, even if we have the picture of not even have gone through even half of the stuff. We are still waiting for the numbers and after getting them we will make the decision on how much to bring. I feel something deeply positive with selling almost everything and start fresh in Lusaka, Mayani wants to be sure his tools and the kids toys will come. And he does not like the feeling of not “finish using” something. Like the sofa we got just a year ago. He has a point. But I like the selling part which is going on all the time right now. The baby and her new stroller is ready to go! 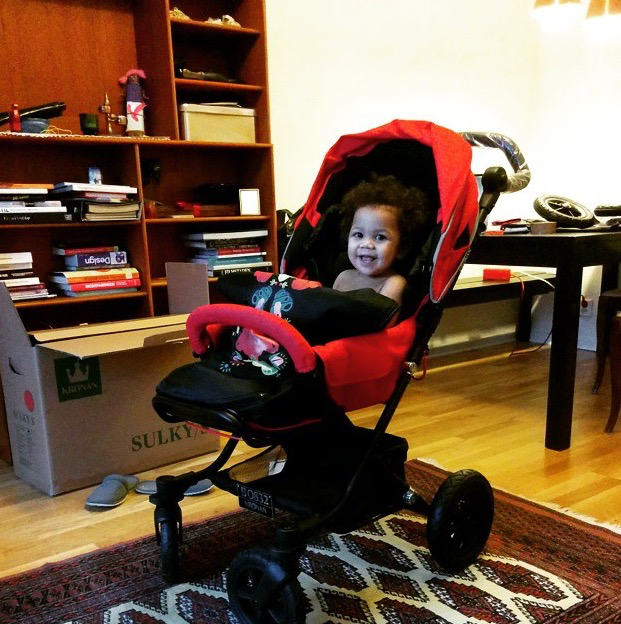 The stroller is a Kronan sulky/s swedish design that I was so lucky to WIN! Follow us on instagram, jchangala! ‹ PreviousGiraffes for Christmas 2015 anyone?